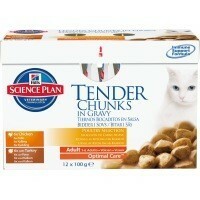 Hills Science Plan Tender Chunks Adult Cat Food Pouches 12 x 85g (Poultry). Hills Poultry Tender Chunks is for all feline friends who love bites of meat in tasty sauce, and is now available in practical single-serving pouches. Who could resist tender pieces of meat in a delicious gravy? Aside from the juicy meat in an exquisite sauce, with every pouch of Hill's, your cat receives a well-balanced diet with exactly the right combination of vitamins and minerals for a long and healthy life. After all, there's a reason most veterinarians prefer and recommend Hill's.